In all of the individual distance races she has entered this season, both World Cup and World Championships events, Norway’s Therese Johaug has remained the undeafeated distance winner, with Sunday’s victory in the women’s individual start 10-kilometer freestyle race in Falun, Sweden marking her twelfth win so far. Starting in bib number 34 out of 56 starters on Sunday, Johaug passed the 3 k mark 11.9 seconds faster than Sweden’s Ebba Andersson to take the leader’s position. The Norwegian not only maintained, but expanded that gap to 19 seconds by the 6.7 k mark, losing only half a second by the time she crossed the finish line in a time of 25:23.9 for the win. With World Cup Finals slated to take place next weekend in Quebec, Johaug has two 10 k distance races remaining to make her 2018/2019 winning streak complete. She is currently ranked first in the women’s Overall Distance World Cup Cross Country standings with 860 points to her name. Finishing 18.5 seconds back from Johaug’s time was Andersson in second place. Andersson had started ahead of Johuag in bib 30, and held the fastest splits throughout the race until Johaug’s start. Her pace was consistently the second fastest time through the 3 k mark, 6.7 k mark to the finish. The podium is Andersson’s seventh individual World Cup top three this season. The race for third came down to the U.S.’s Jessie Diggins, and Norwegians Ingvild Flugstad Østberg and Heidi Weng. 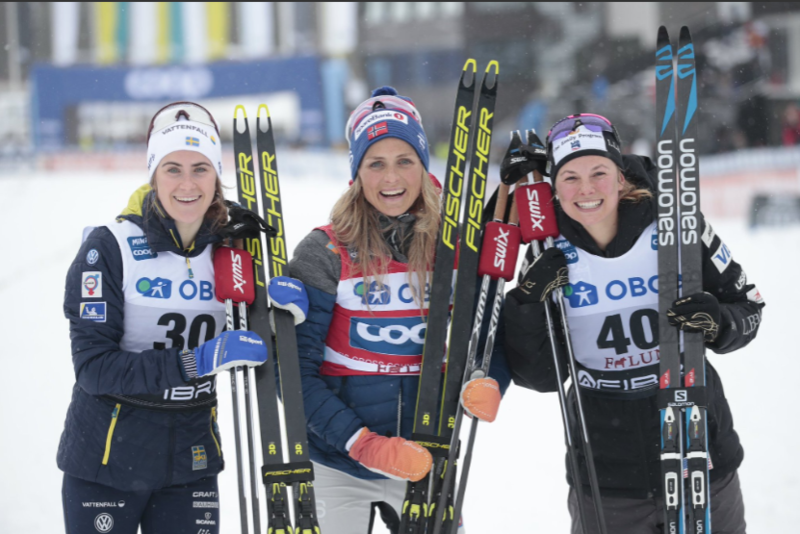 Østberg was first on course in bib 32, with Weng and Diggins chasing down her times in bibs 48 and 40, respectively. By the 3 k mark, Weng’s time was ranked third and she had a 6.3 second lead on Østberg in fourth and a 6.9 second lead on Diggins in fifth. At the 6.7 k mark, Weng had retained the third fastest time, ahead of Diggins by 8.4 seconds and Østberg by 2.5 seconds. By the 9 k mark, Østberg had overcome the 2.5 second gap and had put 6 second into Weng. Diggins had also upped the pace by the 9 k mark, her time leading Weng’s by 4 seconds and trailing Østberg’s by a mere 2 seconds. In the final kilometer, it was Diggins chasing down a two second gap for a Top 3. Her last push was just the right amount to put her 0.5 seconds ahead of Østberg’s time by the finish, and snagging her the day’s third and final podium spot 30.3 seconds back from the winning time. “I knew my fitness and energy were in a great place going into today, and I love this course because it’s so twisty with a lot of turns and places to continue working the downhills all around the course,” Diggins wrote in an email after Sunday’s race. The top three performance is Diggins’s fifth individual World Cup podium this season, her best result so far having been a first place finish in the Cogne freestyle sprint. She is currently ranked fifth in the women’s Overall World Cup cross country standings with 901 points. Ahead of Diggins is Østberg in first with 1424 points, Russia’s Natalia Nepreyava in second with 1327 points, Finland’s Krista Parmakowski in third with 1115 points and Johaug in fourth with 1060 points. Three more U.S. women finished in the Top 30, with the U.S. Ski Team’s Sadie Bjornsen racing to 12th (+1:05.7), Julia Kern, also of the U.S. Ski Team, placing 25th (+1:53.9), and Rosie Brennan finishing 27th. Two more American women competed in Sunday’s race with Kaitlynn Miller of the Craftsbury Green Racing Project finishing 34th (+2:21.5), and Rosie Frankowski of Alaska Pacific University racing to 35th (+2:26.1).